People do not agree now on what ‘progress’ and ‘development’ are. But no-one in this village would want to go back to 1985. Houses now look very different. 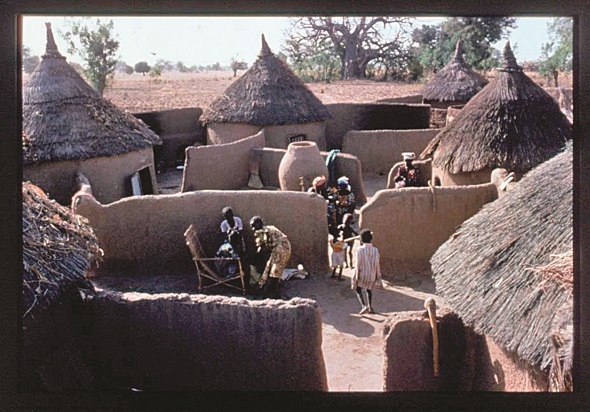 The photo above from 1985 shows a concession (the local French term for a family compound) – traditional round houses with earth walls (colonialists called them ‘mud huts’) and ‘thatched’ roofs. Western people thought they looked pretty. They still have the circular huts, but now they usually use them to store things or for animals or children. People who have some money now live in a rectangular house made of bricks (from baked earth) with a corrugated iron roof. This roof makes it hotter, but lasts a lot longer and protects from the rain more in the rainy season. And they don’t have straw to make the thatched roofs now. In 1995 Mariama wanted a new house like this. I paid her money to interpret for me, and she decided to save it for a house. Every wife has a different house for her and her children to sleep in. That house was built, but the rain destroyed it in 2008. 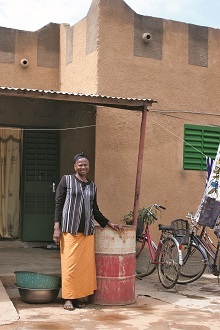 She now has a much bigger, decorated house – bigger than her husband’s. She lives in it with her daughter and her daughter-in-law. Many people did not have money to get better houses. The house usually shows how much money a family has. Inside the houses there is usually no decoration and very little furniture. 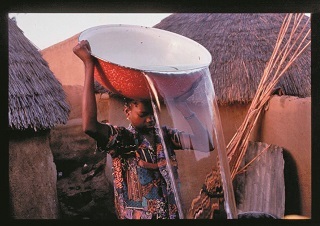 One of the main messages of our 1985 film was that women had to work much too hard – a lot of this was getting water. 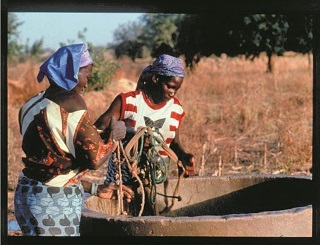 Women had to carry the water for drinking, washing and cooking a long way from one of the few good wells. This took hours every day. 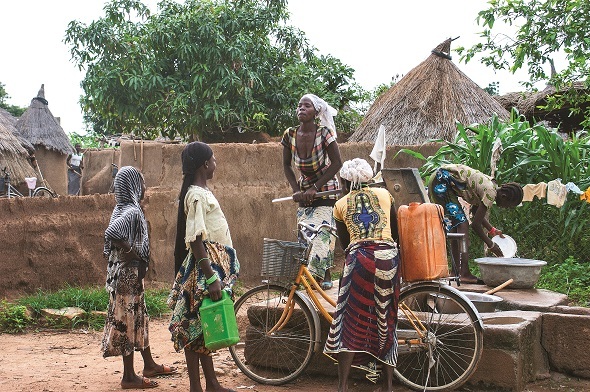 But in 2002, they got the offer of a water pump (from a joint programme between the Burkinabè government and a German NGO). But each family had to give $270 – a lot of money – and also pay for its maintenance. Many families did not have enough money for this. But some did. So there were enough in the village for poorer families to use too. Now people are worried that the water table is sinking so low that the pumps will soon not get water in the dry season. They need new, expensive super pumps to go deeper. They have only three so far. They now carry water in many different ways eg. plastic containers, on bicycles or donkey carts, not on their head. There was no school in Sabtenga in 1985 – only a few children went to school and they had to walk about four kilometres to Garango. In 1995 there was a primary school. It only had three classrooms and only had space for a new group of seven-year-olds every two years. So at least 50 children a year had no education. I gave a lesson to children under a tree about life in Britain and they had a lot of questions. 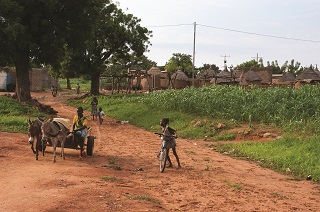 In 2005 there were three more classrooms: Burkina Faso got money from the HIPC Programme for health and education. This village is far from the capital, so this was real evidence that the money was coming to the right places, not going to corrupt government ministers. There were new primary schools in the villages around so there was not so much pressure on the school in Sabtenga. 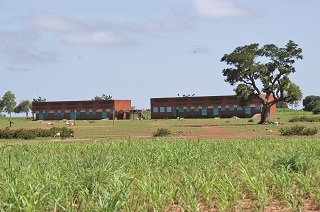 There is now also a secondary school in the village (picture above). It started with one year group, and took in a third year last September. They are planning a new set of three classrooms. Mariama’s youngest daughter Zahara is studying here now. In 1985 there was no real health centre – it was an empty building with no medicines and no staff. 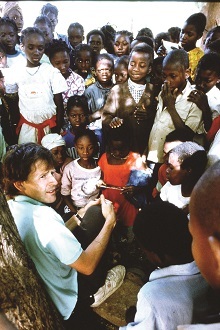 In 1995, it was a working health centre (photo above) – it did not have enough staff, but it was busy and was improving the quality of life in the village. In 2005 there was a separate maternity unit, from debt relief money. But people still had to pay, so many women had their babies at home. Some women died having babies. In 2016 the clinic was about the same, but had more staff. 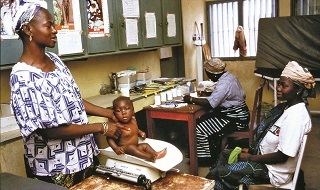 The staff had a lot more work because healthcare is now free for pregnant women and children under five. This happened in June, because of an election promise of the new president, Roch Marc Christian Kaboré. The money for this is coming from more tax on alcohol, tobacco and mobile phones. I saw good primary healthcare. 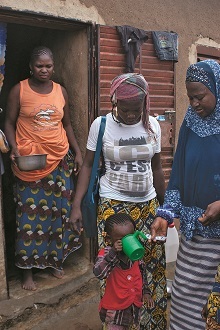 I went out with local health assistants to give anti-malaria medication to all children under five (photo above). 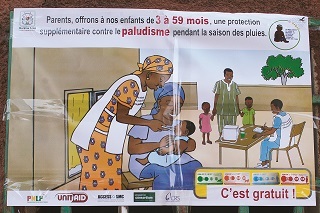 This campaign is supported by many countries and the money comes from the Malaria Consortium. 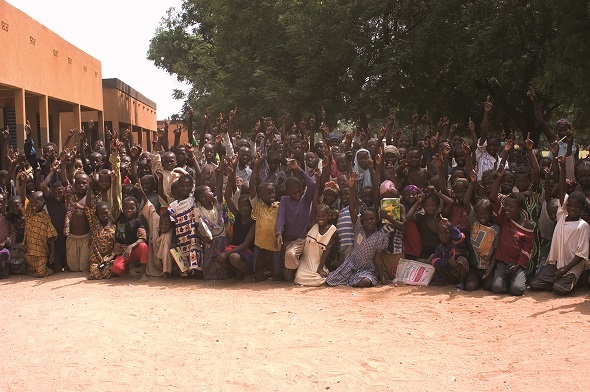 29,000 took the medication to 1.3 million children in Burkina Faso. Traditionally, the only toilet in the village was in the open fields. When the school and health centre were built, they also built toilets, but most people in the village still defecated in the open air. This was bad for health. In 2005, there was better drinking water, but still no other toilets. This shows the lack of progress worldwide towards the Millennium Development Goal on sanitation. 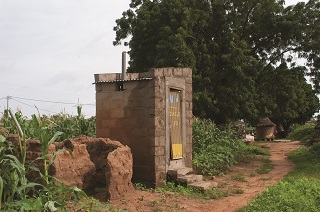 But the local NGO Association Dakupa was building more toilets in the area. In 2016 they had many working toilets. But many were not kept well (photo above) It has often been a problem all over the world to make sure people clean and maintain the toilets in similar programmes. 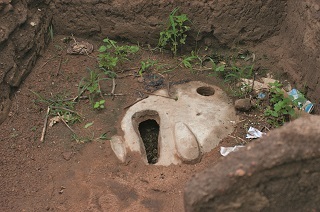 Some concessions now have new toilets to mix faeces with ash to use in the fields as fertilizer. Most people now accept that toilets are safer. Urine often goes to feed plants with its nutrients. 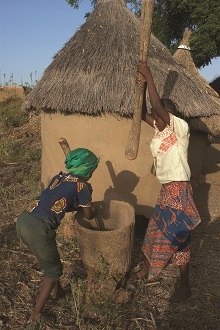 Most people in the village live by growing basic crops to eat - the traditional crops were millet. They made flour from the millet and then made porridge called tô to eat. This was the same in 2005. 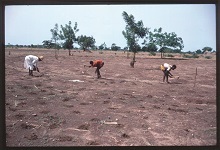 Then, most of the farmers only used animal dung as a fertilizer. But about seven years ago agronomists came to talk about how good it would be to use chemical fertilizer. Some people felt they had enough manure from animals. But when they saw the better results by the farmers who used fertilizer, they changed to chemicals and this is much more common now. At about the same time, most people started growing maize, not millet. This is less work. 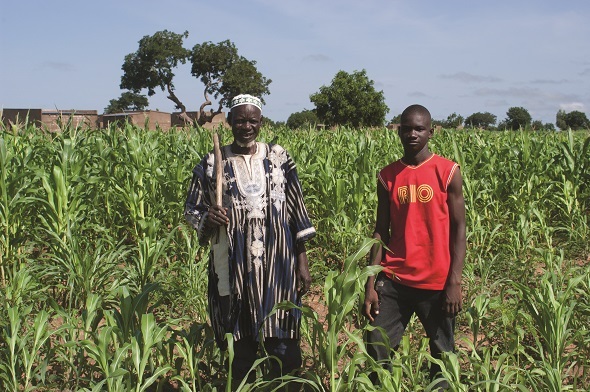 The photo above shows Mariama’s husband Issa in his maize fields (with his nephew, also called Issa). They still make flour from the maize and then tô, but people usually pay others to do this at the village mill now. 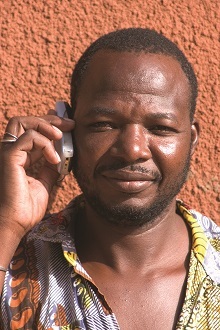 In 2005 I was surprised to see a few mobile phones in the village – this photo showed Ousmane, who works at the dispensary was one of the first people to have one. 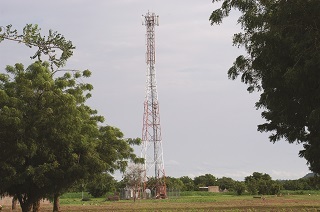 People love mobiles all across Africa so they are almost as common in the village now as in the West. People use them only for texting and speaking not as computers, but they are very important to people who have family working in other countries. If they didn’t have them, they wouldn’t be able to contact them. There is now even a phone mast in the middle of the village, near the health centre. But the most important change in 2016 was that electricity had come to some parts of the village. There are masts with power lines and TV aerials in a few of the compounds. There are not enough electricity meters for many houses. But now, families with electricity can keep food cool and their children can read or do homework in the evenings. I would like to say there was better progress in the political situation of women – but the end of FGM is a big improvement, and because of the new water pumps, they have less work. In 1985 Mariama was on the local Committee for the Defence of the Revolution. Two places were only for women because of an agreement started by Thomas Sankara. Just before his death, he said: ‘Comrades, there is no true social revolution without the liberation of women. I never want to see or go to a society where half the people have to stay silent.’ But this agreement ended after the assassination of Sankara. Now there are only 12 women in the national parliament – this is only nine per cent. 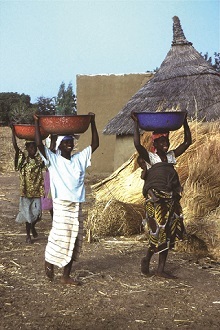 There are women’s groups in the village, but these are not to challenge the control of men, but to give practical support to get some money from food or small businesses. I have been to many village meetings where the men sit on chairs and women sit on the ground. 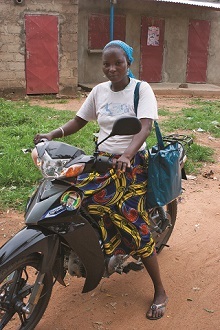 Women now have more bicycles and sometimes motorbikes, like Salamatu Darga, who is taking part in the anti-malaria campaign. But men still control this society. Even the strongest women have to follow what their husband wants. And many men still take a second wife without even asking the first wife. 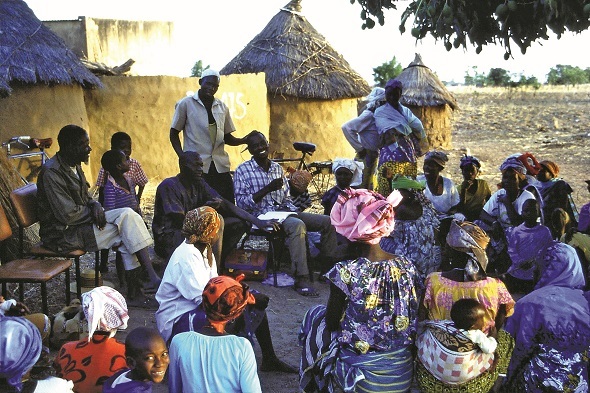 NOW READ THE ORIGINAL:https://newint.org/features/2017/01/01/progress-development-burkina-faso/ (This article has been simplified so the words, text structure and quotes may have changed). This page was last edited on 29 January 2017, at 14:44.